The habit of reading - and physical books to boot - has become a lost art. Gone are the days where we would hunker down on a commute and get spirited away to another world. 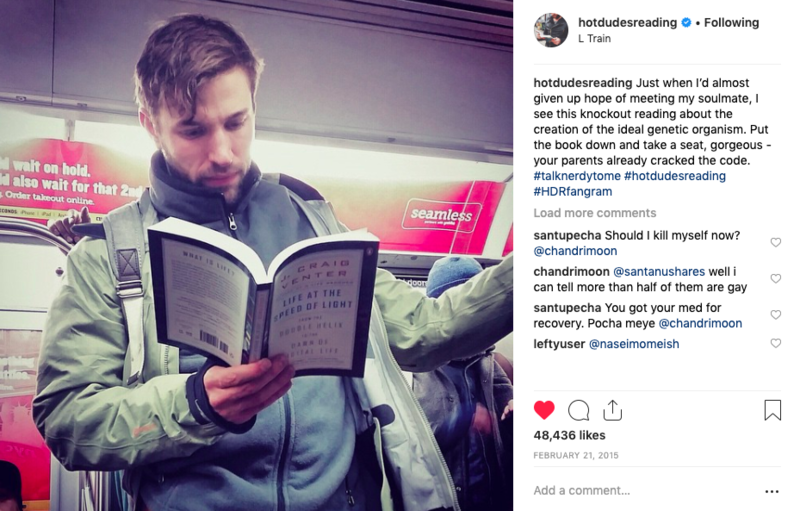 To drive that point home, the Instagram account hotdudesreading made a name for themselves for literally taking candid shots of hot men, well, reading. But it's not just the eye candies that have people anticipating their next catch - it's the witty captions that accompany it as well. Mixing puns, sexual humour, and the voice of a thirsty Manhattanite, the owners of hotdudesreading have perfected their art and nailed their captions while keeping it classy every single time. However, the one thing they have yet to do? Feature a Singapore guy in their rolodex of hot guys reading. On Sunday evening (March 24), hotdudesreading finally graced Singapore with a mention in their posts and featured their first Singapore man. The man in question was pictured sitting on the train (and not in the priority seat, mind you) with slicked back hair and dressed in form-fitting businesswear that hugs his muscular physique. The caption read: "They say Singapore is one of the cleanest cities in the world and taking a look at this crisp and fresh cutie, I’d have to agree. Not one wrinkle on that button down and not a hair out of place. "Despite the clean surroundings, the things I have in mind are anything but. He’ll be calling me his #SingaW***e #hotdudesreading"
As usual, the commenters went wild with hotdudesreading's newest thirst trap, but some in particular, are celebrating the fact that Singapore has finally been represented. In fact, the hashtag 'Singaw***e' (a homophone of Singapore) seems to have tickled their funny bone as well. Some commenters were also quick to express their interest in searching for the mysterious Pan-Asian hunk while others are reconsidering being a smartphone zombie while commuting. Well, if you're also in the mood for, ahem, "a tall glass of vanilla milkshake", we got you covered because eagle-eyed user, yoshijessie, has seemingly identified who this Kyle MacLachlan lookalike is. And as all good romantic comedies would have, there is apparently a twist as user drshane.abucewicz claims that the man is actually his twin brother, who goes by the name of Henryk Abucewicz. Surprise, there are two hotties now! The conversation also revealed that Henryk is aware of the post but is busy travelling in Rome at the moment. In fact, AsiaOne did slide into his DMs to request for a comment but he has yet to respond. Guess we'll have to wait to find out what he's reading. To answer the biggest question on everyone's minds though: Is he single and available? Unfortunately, he's not. A quick search on Facebook also turned up this video of his wedding to his beautiful wife, Clara Lam. Well, looks like it's time to bust out the tissues. Of course, we wish the happy couple all the best and we hope that she doesn't mind her hubby's newfound internet fame - at least for a little bit.